Donut is adjusting well!! Here are a couple of pictures. The dogs are going on walks together and enjoy that a lot. We feel that this is a good fit for him. 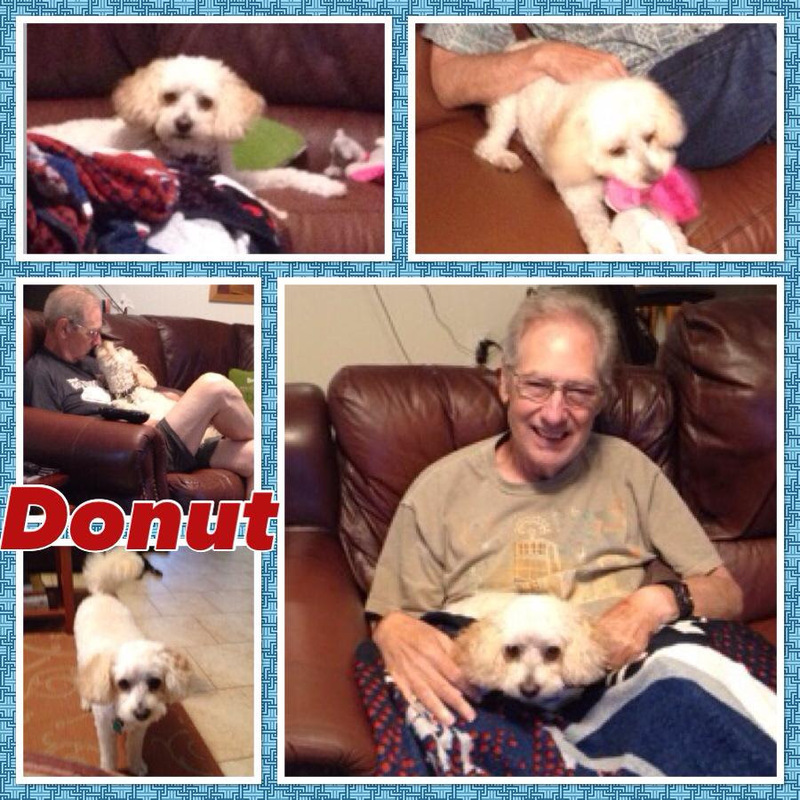 Pepper, although 60 lbs in weight, allows Donut to have the big dog status at 20 lbs. He enjoys car rides and is trying to learn some basic commands. Sit, Stay and Come were not part of his past routines. He is getting better at following these. Thank you for allowing us to adopt him. Rosie (still Rosie) was apparently difficult to adopt out but her new family just cannot understand how she was ever passed up. She is absolutely perfect in every way! Her mom and dad already had several dogs and were not looking to add to their pack. But, as usual, the Good Lord had other plans for Rosie. After keeping Rosie for a three days while their daughter (also Rosie’s foster mom) was out of town, they knew there was no way they could give her up. She was home.These days Rosie spends her time hanging out with her doggie brothers and sister, stealing toys one-by-one from the toy box (or from her brother Charlie), napping in a chair by her favorite window, going on multiple walks throughout the day, and, of course, taking rides around town! Rosie is the sweetest, most amazing little girl and we can’t imagine our lives without her. K-9 Angels, we can’t thank you enough for this precious gift. Thank you all for doing the difficult work that you do. 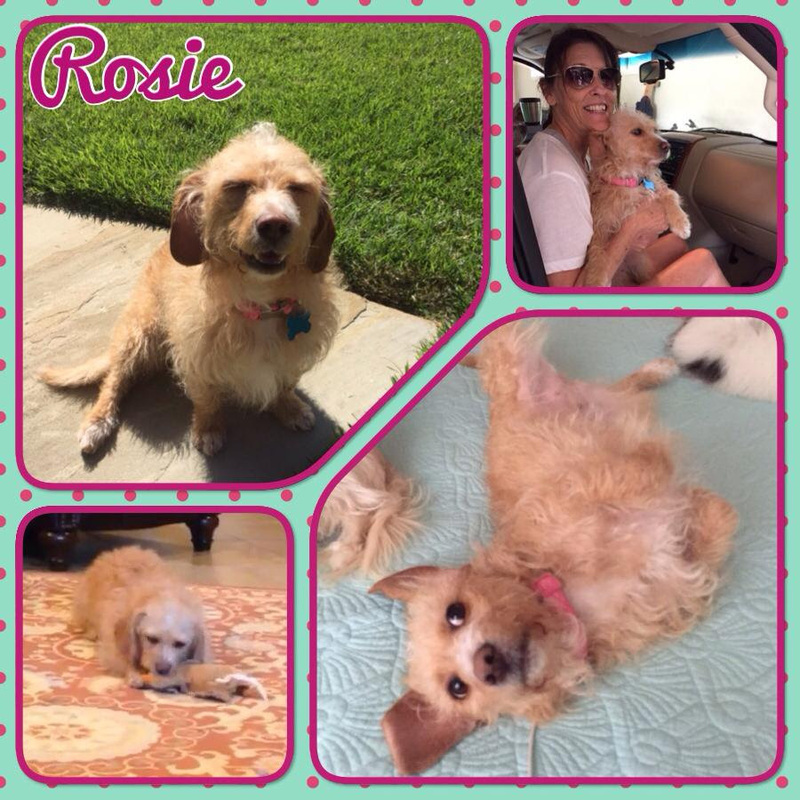 Thank you for ridding Rosie of heartworms and saving her from certain death. Thank you for giving her the chance to live a full and happy life. And finally, thank you for allowing us to bring her into our home. We feel truly blessed to have her in our family! 1. Plan the day. Though it might be fun for you (human) to keep things spur of the moment and off the cuff on a day like the 4th, a lack of a plan can be super-duper stressful and ultimately detrimental to your pet. Take a few minutes now to map out the potential plans for the day: pool parties, cook-outs, visiting friends & families, and, most especially… fireworks. For each potential activity, decide ahead of time where the dog and cat will be and think critically about if that situation is going to be stressful for them (or stressful for you because of them), and then decide on your plan of action to eliminate those stress points so you provide a safe and pleasant experience for your furry family members. 2. Check your pets’ external IDs. Is the writing on their ID tag legible (or scannable if you have a digital ID tag like a PetHub QR ID)? Is their license up to date and visible? Is their collar (or harness) well-fitted so it won’t be easy to back out of, but is still comfortable to wear? Remember — external IDs are the FASTEST way for your pet to get home if they go AWOL (absent without a leash). Don’t rely on microchips or even a GPS collar alone to protect your pet. Make sure they are protected with a current, easy to read and access external ID tag and reliable collar/harness that is worn at all times. 3. Update your microchip data. Speaking of microchips — when was the last time you double checked that the registration for the chip was up-to-date? If it has been more than a year, then that is too long. Your best bet for making sure everything is ready-to-go is to take a quick trip down to your vet and ask them to do a microchip check. They’ll scan your dog or cat, check the data so you can verify everything is current and also let you know if the chip has migrated in the animal’s body. This type of sanity check should be done once a year, and the weeks before a hectic holiday like July 4th is a perfect time. 4. Know your pet’s stress points. Unless your dog or cat is brand new to your home, you likely know if they scare easily with loud noises and lots of commotion. If you are not sure, take some time in the next few weeks to acclimate them to the noises they will hear that night. Also, consider looking into products like Thundershirt and iCalm which can often help alleviate stress during situations like fireworks. Most important of all… refer back to step #1: plan ahead so you have things set up ahead of time for your pet to be comfortable, secure and safe during all activities on the big day. 5. Watch those table scraps! Cookouts will be plentiful on the 4th, and the opportunities for your pooch to swipe hot dog or five will be abundant. A bit of a (healthy) treat here and there is fine — but it is easy for a pup to overindulge as we celebrate around him. Be very mindful of Fido while he roams the picnic crowd, set expectations with your guests ahead of time so they aren’t sharing their plates with him and remind yourself of foods that are toxic and either ensure those foods are always out of his reach or avoid having them at the event altogether. 6. Keep them contained. Most likely, your pets will not be joining you for the big fireworks display after dark (and they most likely prefer that!). Before you leave the house to head to the big show, ensure all doors, windows, and exit points are secured and escape-proofed. Avoid leaving your pets outside while you are away, as this is just begging for an attempt to escape the booms and flashes. The best solution of all is to safely crate your pet. To give them even more comfort, leave an article of clothing with your scent on it to help soothe them, and sound-proof the room they are in as much as possible. And please, come home after the event as soon as you can — it’s been a stressful night for your furry family members and they need some hugs and cuddles. By taking the time in the weeks ahead of a big, loud, overwhelming holidayJuly 4th you can circumvent a lot of stress and danger for your four (or three!) legged companions. 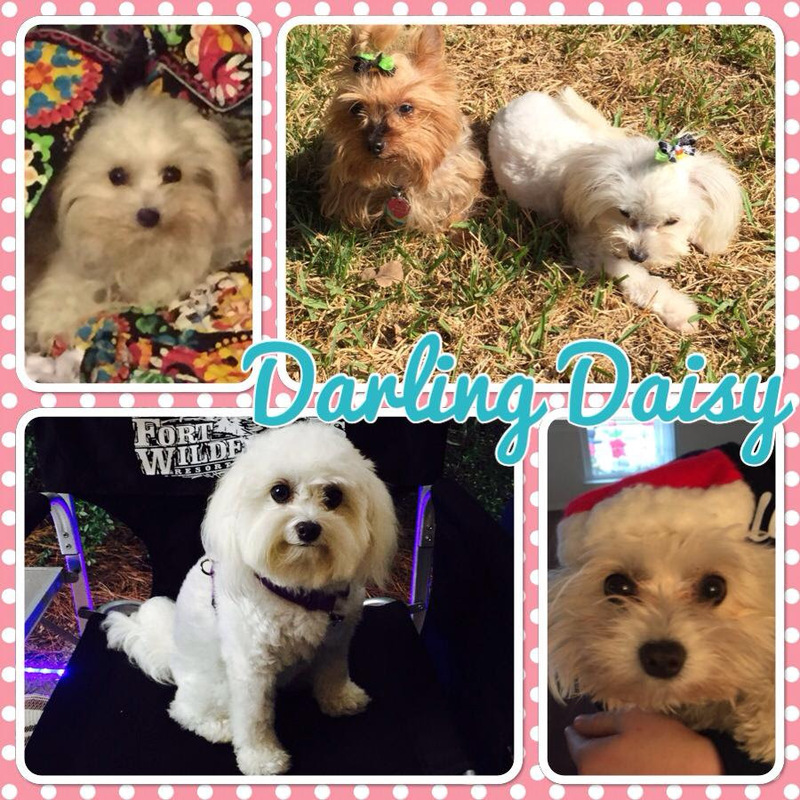 I can never thank you all enough for rescuing my Darling Daisy (aka Darling). She has brought so much happiness and laughter to our family. It was estimated that she was 9 months old by my vet. She weighed 3.9 lbs. and just had her surgery the day before I went to pick her up. She took a while to adjust but has learned her name, to sit, dance, shake, stay & come in 3 months time. She went from a shy puppy to a dog that has never met a stranger and is currently healthy 9.0 lbs. She is currently on her second trip to Disney’s Ft. Wilderness Resort and Campground, for 3 weeks before going to Destin for one week with the family. Thank you from the bottom of my heart for allowing us to adopt this sweet baby. I can’t believe it’s been a year since I adopted this sweetheart from K-9 Angels. She has gone from an underfed scraggly mess (sorry Bardeaux, but it’s true) to a very well-fed, frequent dog-spa visitor. Most things haven’t changed though – except she gets sweeter and funnier every day. I don’t know how I could love her more, but I’m sure I do – every day. 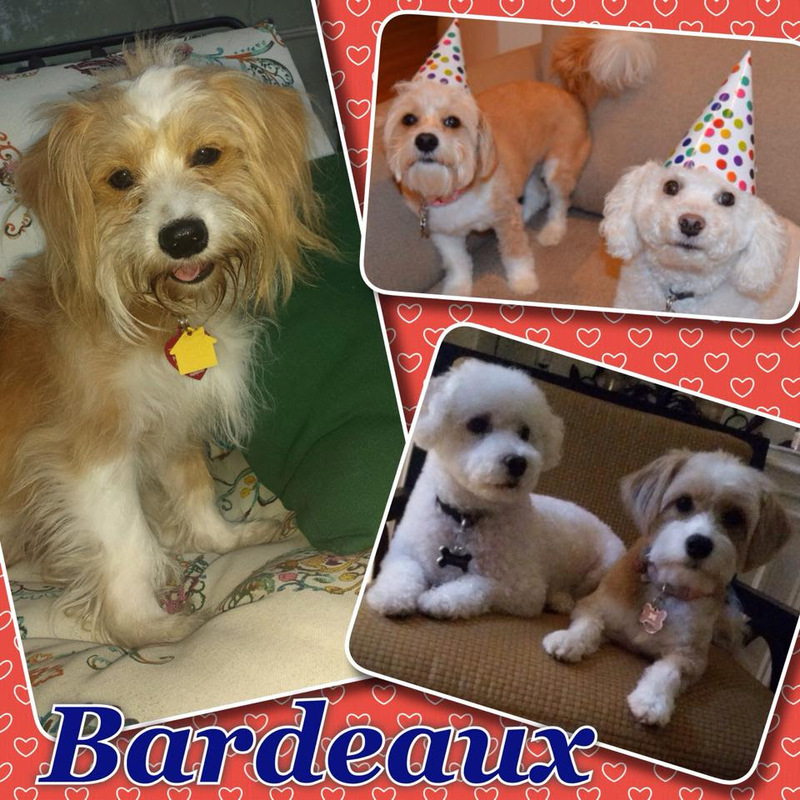 She still gets to spend most of the work day with my mom and her pup, Ti Chien, who has finally fully embraced Bardeaux as part of the family and actually plays with her. Ti C has been with my mom for 6 years and never once played with a toy or liked another dog until just a few months ago. Again, many thanks to K-9 Angels for rescuing and bringing her into my life. by Jessica Peralta You’re walking along with your 80-pound, long-haired shepherd one warm, sunny afternoon. You’re breaking a bit of a sweat, but you feel just fine in your shorts and tank. But then you look over at Thor, and he’s not looking too good … his eyes are glazed, he’s panting heavily and he’s starting to pull back on the leash. Thor is probably on his way to having heatstroke, which means he is quickly losing his ability to regulate his body temperature because of an overabundance of heat. Dogs don’t sweat the way we do – they only have sweat glands in their nose and pads of their feet. And their only real recourse when they are overheating is to pant, which sometimes isn’t enough. Add to that the fact that their bodies are covered in fur and their paws are usually in direct contact with hot concrete or asphalt … and well, it’s easy to see how they can get much hotter than we can – fast. 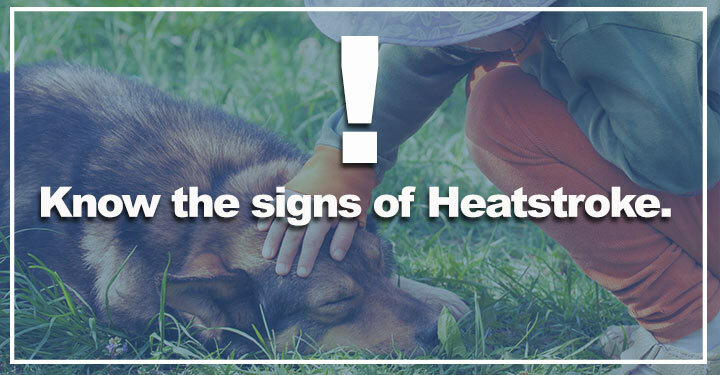 And since heatstroke can quickly lead to irreversible damage to major organs like the kidneys, liver, heart, brain – and can even cause death – it’s important to know the signs. Normally, a dog’s body temperature is somewhere between 100.5 to 102.5 degrees Fahrenheit, slightly higher than for humans. A dog will start to experience heatstroke at over 105 degrees. At around 106 to 108 degrees, organ damage can occur. Always keep a rectal thermometer handy for your dog and check his temperature if you suspect heatstroke. If the overheating isn’t stopped, your dog’s breathing will slow or stop, and he can have seizures or fall into a coma. Obviously, we don’t want any of that to happen. So, what should you do if you think your dog has heatstroke? My Dog Has Heatstroke, What Do I Do? Whenever the weather gets warms, it’s a good idea to pay special attention to how your dog is doing. And know your dog: Breeds with “flat faces” like Pugs and Boxers, elderly dogs, puppies and sick dogs are at even greater risk of overheating. Things progress quickly when it comes to heatstroke, so as soon as you detect a problem, act quickly. Since heat is the obvious problem, the goal is to get him out of it and away from direct sunlight. Get water on his inner thighs and stomach where there are more large blood vessels, and on the pads of his feet. Use running water via faucet or hose and avoid submerging your dog in a tub or pool because this could cool him too fast and cause other problems like cardiac arrest and bloat. Also, avoid cold water or ice because these will cause the blood vessels to constrict, slowing blood flow and the cooling process. To help cool your dog, you want to make sure the water you’re putting on him can evaporate. To that end, you’ll want to avoid covering him up with a wet towel or blanket because rather than allowing the water to evaporate, this will create a sauna effect – which you don’t want. Keep him out of enclosed areas like a kennel; instead, keep him near flowing air like from a fan or air conditioner. Encourage your dog to stand or walk slowly while he’s cooling down, so that his cooled blood can circulate throughout his body. Give him small amounts of cool – not cold – water. If he gulps down too much water too fast, it can cause vomiting or bloating. …if he doesn’t want water, but avoid human performance drinks. Get him to the vet. Once your dog has started to cool down, you can stop your efforts and take him to his vet right away. You don’t want to continue trying to cool down your dog for too long or you’ll risk him getting hypothermia. Your dog will need a veterinary exam even if he seems fine because there may be underlying damage to his organs that you can’t see. Even if he seems normal, the effects of heatstroke can continue for 48 to 72 hours following the initial heatstroke. According to William Grant DVM, the most common cause of death following heatstroke is disseminated intravascular coagulopathy (DIC) which is blood coagulating throughout the body; it can occur hours or days after the heatstroke episode. In addition to cooling down your overheated dog and taking him to the vet, consider giving him one of these homeopathic remedies to help in his recovery. This is a good first choice at first sign of heatstroke. If your dog needs this remedy, he may also seem very fearful or anxious. Give three pellets every 10 minutes for up to three doses. If he doesn’t seem better, try one of the other remedies listed. If the dog needs this remedy, he may seem very weak and his muscles may be trembling. Give three pellets every 10 minutes for up to three doses. If the dog is not any better, try the next remedy. You may see vomiting and weakness. His gums may be pale, red or have a bluish cast. Give three pellets every 5 minutes. Jessica Peralta has been a journalist for 15 years and an animal lover all her life. She has had dogs, cats, birds, turtles, fish, frogs, and rabbits. Her current children are a German shepherd named Guinness and a black domestic cat called Derby. It’s because of them that she decided to become a pet nutritionist and focus her journalistic career on the world of holistic animal care. She loves spending time with them and also learning about all the ways she can make them healthier, the natural way.